We used BATE [during lecture] for real-time titration curves generation. I was finally able to show how the curve shape changes depending on the acid strength and concentration. Great experience, highly recommended. Buffer calculator is not yet another simple program using Henderson-Hasselbalch equation with all its intrinsic limitations. 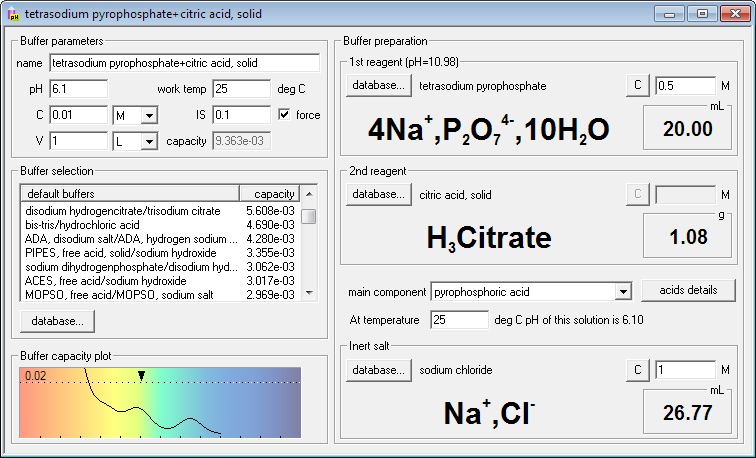 Buffer Maker buffer calculator is built around a powerful pH calculation engine, able to deal with any mixture of acids and bases. Buffer calculator can be used to prepare buffers using multiprotic acids with close pKa values or using acids too strong for the Henderson-Hasselbalch equation. Calculate composition of any buffer in no time. Force ionic strength with any inert salt. Save your prepared buffers on the disk for further reference, or to share them with your coworkers. Select buffers from the buffer database, add buffers to the database, modify buffers in the database. Print an exact recipe with pH vs temperature and buffer capacity vs pH plots. Use buffer capacities to select the best buffer for a given pH. Select which component of the buffer will have given concentration. Calculate pH of any acid/base mixture. In the buffer calculator each buffer is a mixture of two reagents. The reagent is something that you can have standing in the bottle on the shelf - it can be 1M acetic acid solution, solid potassium sodium tartrate, salts of weak acids and weak bases, like ammonium hydrogen phosphate (solid or dissolved) or even buffer solution - for example pH=5.00 acetate buffer. When you enter the required pH Buffer Maker buffer calculator will - whenever possible - calculate how much of both reagents have to be used to prepare solution. Please check buffer preparation example to see how easy it is to find best buffer for a given pH in the program database and a buffer design example to see how flexible program is when it comes to test new mixtures of reagents. If you are interested in pH calculations, see pH calculator use example. Buffer Maker buffer calculator needs any PC class computer with properly running Windows - any version published after 1995 should do.